I've always associated taxidermists with the rural backwoods, not an admittedly far-flung suburb of Chicago. But we have our own, right here. What does that say about us? It certainly doesn't make me feel pride passing through a historic downtown area capped off by a ramshackle house with a sign reading "Vern's Taxidermy." Doesn't exactly have a lot of cachet, now, does it. When we moved here, around 15 years ago, we made jokes about it but considered it part of the charm of living so far away from the city, a reminder we lived in a "real" town, not a suburb created by some modern urban planner. But with the passage of years it's come to be more and more an eyesore, less and less a reminder of small town charm. I've heard some people preserve their beloved pets when they die, curling them up into sleeping position as they looked in life, placing them by the fireside on a comfy dog bed. Imagine someone with a child coming into your home, a child who bends down to pet good old Sparky, finding him hard as a rock. "Is this a fake dog?" The piercing screams would ring in your ears for a week. Over the weekend our daughter's hamster went "to a better place." One day she was happily running on her wheel, the next she was curled up dead in her little hamster hut. Somehow, the thought of having the little thing stuffed never occurred to us. Instead, my daughter took a little jar (to avoid the horror of one of our dogs digging up her little body, trotting it around the yard like a prize), put in some bedding (to keep her warm for eternity, she said), and placed little Lola inside. We buried her in the back of our house, against the foundation where the ground isn't frozen, my husband eulogizing her way past the point required for one's hamster. Then he suggested we should each throw in a handful of dirt, to complete the solemn ceremony. My kids: "Ummm, dad, I think you should just cover it up with the shovel." Sentimentality apparently has its limits. 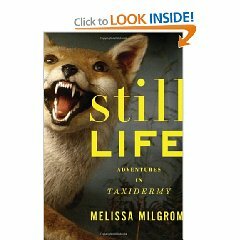 Enough people must be interested in taxidermy to warrant a book, but it completely mystifies me. If you're one of them, far be it from me to discourage you. Just don't ask me to pet Sparky. Hmm, would have to pass on this one. I love a good niche, offbeat science book, but this is a bit much even for me. “Is this a fake dog?” I laughing out loud right now. We have so many dead animals buried in our back yard I wonder if it’s legal. I was going to write that I think the idea of stuffing beloved old Rover or Fluffy absolutely abhorrent. Until (being an anthropologist), I recalled some of the bizarre things we humans do with other humans once they die. For example, one group of Dayak people in Kalimantan (Indonesian Borneo) ‘smoke’ their dead to preserve them, and then store them in rafters of their long houses. When there’s an important ritual or event, they bring old grannie down from the rafters and set her a place at the meal. So maybe pet taxidermy isn’t as bad as it sounds. Although, I won’t be stuffing my cats or dogs when their mortal coil winds down. Amanda, must be a bummer when old grannie’s arm falls off during the main course.